It's no secret that I'm a bit of a magpie when it comes to jewelry, and I found this CC Skye pave spike bracelet from Linger Rose simply irresistible. I'm sporting it solo here, but it will soon be the star of many an arm party. Both Linger Rose, and their sister company Loving Lemons carry tons of fabulous jewelry from designers like CC Skye, and Linger Rose is offering one Chic on the Cheap reader a piece of CC Skye jewelry of their choice! Head down to the Rafflecopter for more details and to enter the giveaway! Giveaway is for your choice of any one piece of CC Skye jewelry in stock at Linger Rose. Like Linger Rose on Facebook. Like Loving Lemons on Facebook. Create a Pin Board titled "Linger Rose CC Skye Jewelry Giveaway" and pin at least five CC Skye items from LingerRose.com to it. Enter with the Rafflecopter below - all entries will be verified! Love the bracelet and your look, super chic! I really like this look ! The grey with white is a great pairing. Hi, is this giveaway open internationally? 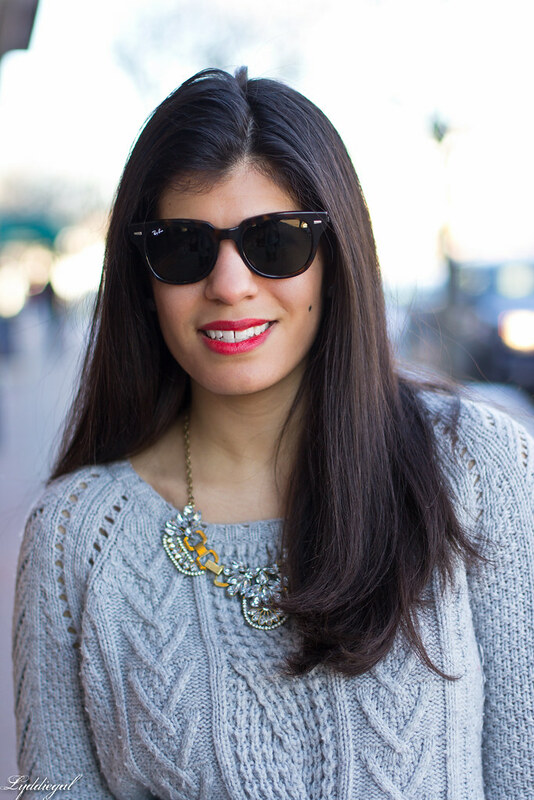 That cable knit sweater looks super cozy! Love how you paired it with the houndstooth! Great bracelet and sweater! I am really loving your coat though. You have so many amazing coats! Oh I love that spiked bracelet, is such a fun icing to your wrist! I recently ordered a pave chain bracelet, keeping my fingers crossed is as cute as it looks on the pic. I love white and grey together, looks really chic! Loving this outfit! Great booties, and the jewelry is fantastic. Jewelry is so fun! I'm a total sucker for spikes. I think it goes back to my punk days in high school. I love this mix of neutral and punky! Loving this look; and that bracelet? what a great little pop piece! You are a girl after my own heart - sparkly jewelry, an outfit in black white and gray, and pops of red. What's not to love? Pretty much nothing, as far as I'm concerned :) Although thinking back, I realise that I have a very similar outfit in my regular rotation for work days so maybe I'm slightly biased? Either way, I love this look! what a pretty necklace. and i love your nails and sweater together! You look beautiful. I love that bracelet. I hadn't heard of CC Skye jewelry before but it definitely has so many pretty pieces. It's beautiful! I love that sweater! Ugh this outfit is so good! Pattern mixing! Neutrals! Red! Ahhh, I am 100% so in love with this outfit, Lyddie~! It's so clean and I adore the layering of a sweater over a dress. Why haven't I done that yet this winter??! I guess I've gotta before it gets warm! I'm magpie myself.Sparkles, sparkles. Maybe that's why I began to make my own jewelry. I love this look. I find myself hard to find full skirt which doesn't swallow me. You have found just perfect skirt and you have paired it so gorgeous with cozy sweater. Love this look! i love all your pavè jewelry in this outfit. really beautiful…. I think this is my favorite look from you so far! LOVE it! and i cannot get enough of that bag. That was a great buy. Love the houndstooth coat! I kinda miss wearing coats...it's just to warm here. And that skirt is super cute too!